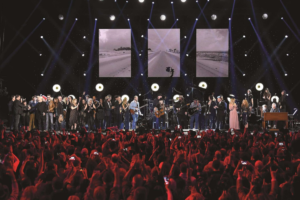 It takes a village: A star-studded lineup paid tribute to Willie Nelson on Jan. 12 at Nashville’s Bridgestone Arena as part of the “Willie: Life & Songs OF An American Outlaw, A Willie NElson All-Star Concert Celebration.” The performance will air later in the year on A&E Networks. On a drizzly, windy Saturday afternoon in January, with Nashville’s honky-tonk bars buzzing a block away, Keith Wortman sits on a leather chair in a small room backstage at the Bridgestone Arena. In six hours, Chris Stapleton, backed by a top-notch group of players led by Don Was (Wortman’s longtime creative partner), would kick off a memorable tribute to Willie Nelson: “Life and Songs of an American Outlaw.” To Wortman, founder of Blackbird Presents, the first song is the culmination of Blackbird’s latest celebration of a legendary musician. Other types of concerts, namely festivals, count on sponsorships to bolster the bottom line. Blackbird has done roughly 25 all-star celebrations to date. In addition to one-off concerts, Blackbird has the Outlaw Music Festival it produces with Nelson and his manager, Mark Rothbaum. In 2018, 17 Outlaw Music Festival concerts averaged 8,887 tickets sold per night and an average gross of $426,160, according to Pollstar data. “Life and Songs of an American Outlaw” was like a festival in a bottle, a one-stop shop for Willie Nelson music performed by a multi-day festival-worth of talent. Sure, their appearances were typically limited to a song, and not always a duet with Nelson, but each performance had the emotion of a 30-minute set. The crowd hung on every note. Out of about 16,000 fans in attendance, you could count the people who left early on one hand. Many performers were past participants at Nelson’s roving Farm Aid concert or Outlaw Music Festival (produced by Blackbird with Nelson and his manager, Mark Rothbaum): Jack Johnson, Jamey Johnson, Alison Krauss, Sturgill Simpson, Margo Price and Sheryl Crow. Nathaniel Rateliff, who performs with his band The Night Sweats, said he tries to be more involved with Farm Aid every year. Rateliff just happened to have a free day before flying to Europe for a tour. “I would have been bummed to be too busy or if our tour had already started.” Lyle Lovett, who performed “My Heroes Have Always Been Cowboys,” noted Nelson’s ability to bring people together. “Willie’s my hero [and] one of the most special human beings that ever walked the planet.” John Mellencamp, who co-founded Farm Aid with Nelson and Neil Young, and Dave Matthews both turned in memorable performances. Both are Farm Aid board members. Nearly every song per-formed was written or co-written by Nelson – with a few exceptions. Jamey Johnson wowed the audience with his version “Georgia on my Mind,” written by a close friend of Nelson’s, Ray Charles. Jack Johnson performed “Willie Got Me Stoned and Took My Money,” an original song he debuted at 2015’s Farm Aid concert. One performer, in particular, lacked a connection: George Strait. Announced to a standing ovation as “The King of Country,” Strait explained he showed up because he and Nelson had never performed together on stage. Strait showed up with a humorous song written just for the occasion. It was a fitting end to the show before the requisite all-star jam closed the evening with superstar performers backed by an orchestra of guitars. “Life & Songs of an American Outlaw” worked because it adequately paid tribute to Nelson and his legacy. Look for it on A&E – it’s part of the business model, after all. This entry was posted on Sunday, January 27th, 2019 at 3:01 pm and is filed under Awards and Honors. You can follow any responses to this entry through the RSS 2.0 feed. You can leave a response, or trackback from your own site.